Ms. Al-Suwaij is the co-founder and Executive Director of the American Islamic Congress (AIC), a nonprofit established in the wake of the September 11 attacks to build interfaith understanding; mobilize a moderate voice in the American Muslim community; and promote civil rights in the Muslim world. Al-Suwaij’s personal mission is to promote a positive Muslim-American voice that strengthens interfaith relations and addresses the many challenges in the Muslim world. She has developed classroom curricula; works with the Anti-Defamation League; and serves on Connecticut’s Hate Crimes Advisory Board. Her writing has appeared in numerous publications, including The Wall Street Journal, New York Times, Boston Globe, and Hartford Courant. Al-Suwaij has been interviewed on NPR, CNN, Fox, and Al-Jazeera. She has lectured at Harvard, Yale, Georgetown, and many other campuses. She spoke alongside George Clooney at a massive April 2006 rally to Save Darfur in Washington, DC. 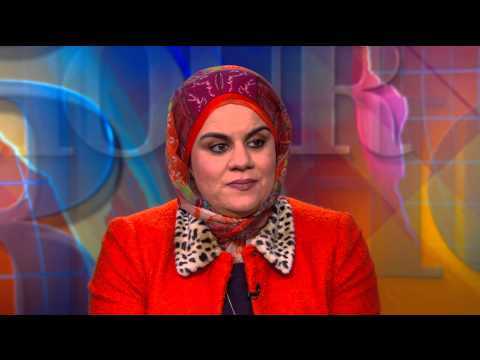 Ms. Al-Suwaij is the co-founder and Executive Director of the American Islamic Congress (AIC), a nonprofit established in the wake of the September 11 attacks to build interfaith understanding; mobilize a moderate voice in the American Muslim community; and promote civil rights in the Muslim world. Al-Suwaij’s personal mission is to promote a positive Muslim-American voice that strengthens interfaith relations and addresses the many challenges in the Muslim world. Al-Suwaij was born in Basra, Iraq, in 1971. After participating in the failed 1991 uprising against Saddam Hussein (an experience she recounted in a memoir for The New Republic), she fled to the United States. The granddaughter of Basra’s leading cleric, she is a Hashemite, a direct descendant of the Prophet Muhammad. Al-Suwaij characterizes her personal religious beliefs as a hybrid of traditional and progressive. Al-Suwaij leads interfaith and tolerance programs for mosques, churches, synagogues, colleges and high schools. She has developed classroom curricula; works with the Anti-Defamation League; and serves on Connecticut’s Hate Crimes Advisory Board. She is a board member of George Mason University’s Center for World Religions, Diplomacy, and Conflict Resolution and has been named an Ambassador for Peace by the Interreligious Federation for World Peace. Al-Suwaij has testified to the Senate; briefed the President and Secretary of State; and works with Congressional leaders from both sides of the aisle. Her writing has appeared in numerous publications, including The Wall Street Journal, New York Times, Boston Globe, and Hartford Courant. Al-Suwaij has been interviewed on NPR, CNN, Fox, and Al-Jazeera. She has lectured at Harvard, Yale, Georgetown, and many other campuses. She spoke alongside George Clooney at a massive April 2006 rally to Save Darfur in Washington, DC. Since the toppling of Saddam Hussein, Al-Suwaij has been working in Iraq to strengthen women’s rights and help rebuild the Iraqi education system. She led the Iraqi Women’s Educational Institute, which trained female civil society activists in principles of democracy and civic leadership. Al-Suwaij co-founded the Iraqi Women Higher Counsel – which successfully lobbied the Iraqi Interim Governing Council to mandate 25% of parliamentary seats for women. Al-Suwaij’s latest initiative is HAMSA, a project that unites Americans to support human rights activists in the Middle East. She helped launch an essay contest for young Middle Easterners on the importance of individual rights, serving on a judging panel with Azar Nafisi, and Gloria Steinem. Al-Suwaij also directs the AIC’s Washington office, promoting a progressive Muslim agenda to political leaders and policy makers.